In our last post we explained our intention to “experiment” with FixMyStreet in Alcalá de Henares. FixMyStreet is a web platform that allows citizens to notify to the authorities problems in the urban infrastructure -for example, broken paving slabs or street lighting not working- that require to be fixed. Our intention is to test FixMyStreet in Alcalá in order to evaluate how FixMyStreet would work in the context of Spanish municipalities. In our post we also explained how important it is, for this kind of initiatives, to secure the commitment from the municipal administration to respond to citizen reports. It is equally important to launch the platform in a way that attracts an initial ‘critical mass’ of residents to start using the tool. prepared a press release and publicity material. We considered very impo rtant to stress the willingness of theCity Council to participate in this citizen initiative and its commitment to respond to the system’s reports. To achieve it, it was decided that the municipality would be the one launching the awareness campaign. On December 2, a post on CUIDA.ALCALA.ORG was published on the municipality’s website and the press services from the municipality distributed a press release among the local media. The press release clearly indicated that the initiative was launched by the civil society, but also signaled their willingness to support and take advantage of it. Local media picked up the story quickly, which was widely circulated by the written press (for example, Diario de Alcalá, La Luna de Alcalá, Alcalá Hoy, Alcalá y más o El Heraldo de Alcalá) as well as the radios with local programming: both Cadena Ser and Onda Cero interviewed us. We also launched a campaign in social networks like Facebook and Twitter, and references to the system and the explanatory video were widely shared. Finally, a report about CUIDA.ALCALA.ORG also appeared in a printed bulletin from the citizens party “Somos Alcalá”, which co-governs the city since last elections (see pictures). In the following days a stream, or rather a “flood” of reports inundated the system. In barely three days more than 100 problem were reported. This clearly shows that citizens demand channels to communicate issues to municipal authorities, a demand that is currently unfulfilled in most Spanish cities. 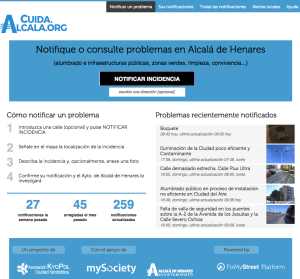 Moreover: CUIDA.ALCALA.ORG is designed to report urban infrastructure problems -things that need to be repaired- and indeed, most of the reports received were related to these cases. But more “general proposals” and “suggestions” were also sent, such as requesting a new bus stop in a certain neighborhood, or suggesting new roads for cars or bike lanes. Neither our platform nor the staff that manage the notifications can really address these kind of “suggestions”. In the best case they can be forwarded to the responsible service, but there is no guarantee that the suggestions will be even considered. Such reports show, on the one hand, the desire of citizens to contribute and collaborate with the authorities to improve the city. On the other hand, they illustrate how, when the municipality does not provide a channel to allow citizens to voice concerns… they will use whichever tool is available, even if it is not the “correct” one. After two weeks in operation, the flow of notifications has calmed. Currently, around 5 new problems are reported each day. In total, 181 notifications have been sent by 76 different users. City Council and citizens have updated them 288 times: city council to communicate actions taken to resolve the issues, citizens to provide additional information or to demand action. In these two weeks, 48 cases have been declared “fixed” and 12 have been “closed” because of being a duplicate, the council not being competent, impossibility to fix them, etc. 72 cases that are currently open and 42 under investigation or with a scheduled action. All in all, this means… that the experiment is working!! Alcalá’s City Council is currently restructuring Citizen Attention Services to increase its capacity to handle interactions with citizens in a more systematic and efficient way. But for now… we believe that Residents, Citizen groups and City Council have many reasons to feel pleased with what they have achieved so far in CUIDA.ALCALA.ORG: they are already collaborate and work together to improve the city. BY THE WAY: if you work at a municipality that would like to launch its how “CUIDA TU CIUDAD”… contact us at info@kyopol.net and we will see how to make it happen.